Working as a Technical Support Engineer for Geomagic I get to see it all when it comes to what customers are reverse engineering. I see the parts that make customers blue in the face. You know, parts missing entire sections of scan data. Parts with faces that are supposed to be flat but never really are. Parts with damaged features that are hardly recognizable after scanning. Imperfect meshes in an imperfect world. But with Geomagic Spark I see something different. Geomagic Spark isn't picky. It doesn't care if your meshes are full of holes. It doesn't care if your scanned part isn't perfect. 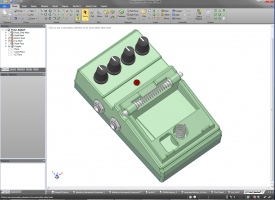 Geomagic Spark gives you the tools and flexibility to design the way you intend. How do I know all this? Well there comes a point for any young technical support engineer's career where they need to learn the new products they'll be supporting. And what better way to learn the new software than to go into one's garage and just pick something? It turns out picking a part was actually the hardest part of the whole process. You see we're a bit competitive here at Geomagic and everyone was quick to show off their latest and greatest creation in Geomagic Spark. Having seen plenty of manifold covers and generic industrial parts, I realized I needed something that rocked and rocked hard. Sitting tucked away in my garage was just the thing: a stompbox. 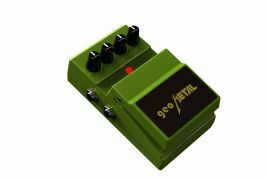 For all you non-guitar people a stompbox produces heavenly distortion capable of crushing. When used properly, the volume knob will be set to 11, and it provides an excellent way to meet your neighbors and local law enforcement without leaving the comfort of your own home. Oh, and it is a great assembly part. If there's one thing heavy metal and Geomagic Spark have in common, it is pure unmatched speed. From the start this project went quick. I scanned the part with a Faro Platinum while the developer using it was taking lunch at the drive thru. Needless to say, Geomagic's scanning implementation in Spark definitely won't having you saying,"Well, their new stuff is OK, but their old stuff was better." In other products hours tend to be wasted fretting over the perfect mesh. While Geomagic Studio and Wrap users will find many of their favorite mesh editing commands are back and better than ever in Geomagic Spark, I'm happy to say you won't be banging your head trying to make an imperfect scan perfect. After removing a bit of over-scan and noise, I was ready to jump right in a start creating surfaces and features. One feature I love about Geomagic Spark is how well the new detect regions commands work in conjunction with familiar SpaceClaim commands. After detecting regions I selected a face to fit a plane, but instead of fitting a surface, I used the region selection for a feature plane. Using the Move command in conjunction with the control-key will create a duplicate object. Using this method, I very quickly set up two more feature planes and aligned my part to the world. I would later use these features in my assembly to not only align finished components but also to add constraints and"assemble" my scanned data. Feature planes are also great for sketching and extruding. With the scan data visible and a feature plane selected, entering sketch mode presents the user with an awesome 2D cross section of the scan data. The user can simply draw a profile while snapping to the scanned data. However, the best part is that you're not constrained to just the scan data. If you know a radius isn't really .247981 inches or two lines should both be 15 degrees and parallel, design intent changes are easily corrected at any time whether you decide to do so in the sketcher or back in 3D mode. Besides, if you make a mistake it's pretty easy to fix revert with 50 levels of undo available. Another great feature of Geomagic Spark is the ability to Copy and Paste just about anything. Really like that surface you created a few steps back, but you scrapped it and don't really want to lose your recent work? Undo, copy the surface, redo and paste it back. Accidentally realize you're sketching on the wrong surface but don't want re-sketch everything all over? Copy your sketch profile to the clipboard, undo, start sketching on the correct surface, and paste. Simple. This came in handy. I found out this part is not a perfect shell. Inside the part were a few indentations and reinforced areas that were reflected on the outer surface of the part. I was able to create the pseudo-shell quickly by performing the shell command, copying the resulting inner surfaces I needed to the clipboard, using undo to revert prior to the shell command, and using the copied surface as a Boolean subtraction. 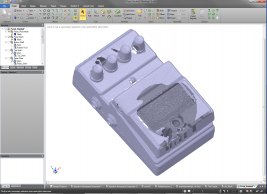 Geomagic's region detection tools made quick work of the larger solid areas of the part. For tweaking my solids and crafting those smaller details that have tendency to melt during scanning, I found sketches and the pull tool to be invaluable. The pull tool however isn't just some simple extrusion tool. The pull command allows the user to draft, revolve, sweep and radius geometry until your clicking fingers bleed. I'm pretty sure you can use the command on anything. I'm still finding new ways to use it. In fact after installing my favorite metal font, the project and pull commands let me imprint an annotation straight onto the model. I am absolutely thrilled about providing support for Geomagic Spark. There are so many different ways and intuitive ways to use each and every command. I never felt stuck or out of options making this model. Whether you're the type to stick with a single command or the type to try modeling an object using every command possible, it's hard not to create a great model from scan data in Geomagic Spark.